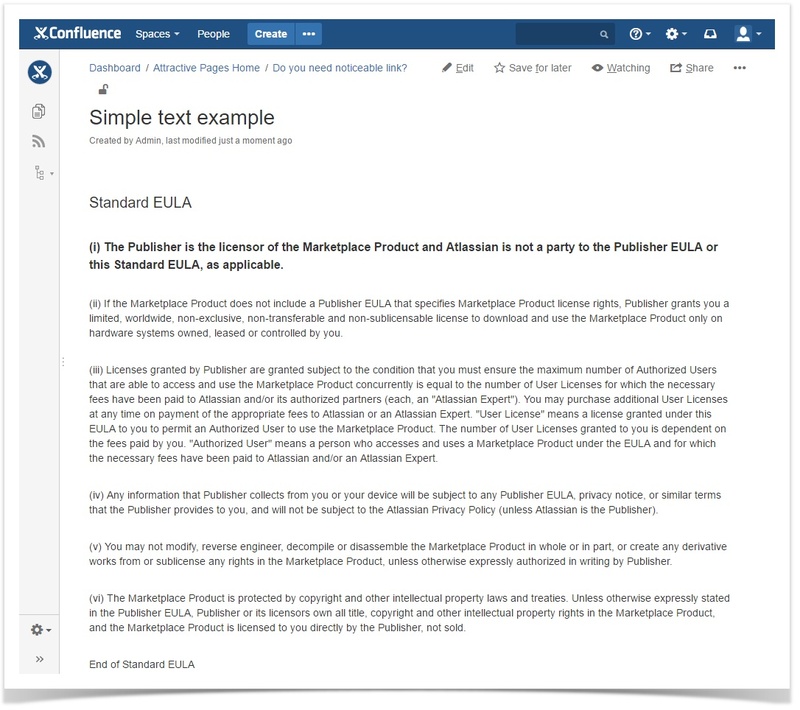 We continue our series of blog posts about useful tips and tricks in Confluence. In the recent blog posts we were writing scripts for counting the number of checked and unchecked boxes in tasks lists and for counting status labels of all types. During development and testing of this add-on we have found it quite useful and started using its capabilities in some Confluence spaces for better user experience with statuses. At the moment Confluence allows you to add status labels and set their titles, as well as select the appropriate color from the default ones. But there are only 5 colors for your choice; this can be not enough for you. An additional problem is with addition and management of the Status macro. You can change the status only when you switch the page to the edit mode. It is quite inconvenient when you want to instantly change status for some task or subject. Our custom add-on resolves all these issues and gives you much flexibility for management of statuses and rapid change of status while viewing the page. 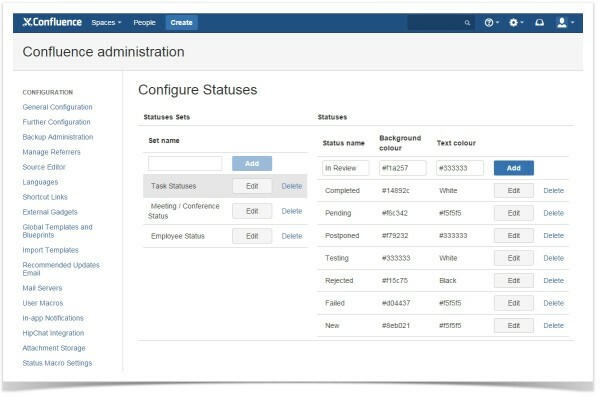 An additional enhancement, which the add-on offers, is centralized management of status types. Now you can create separate lists for different task types or things. 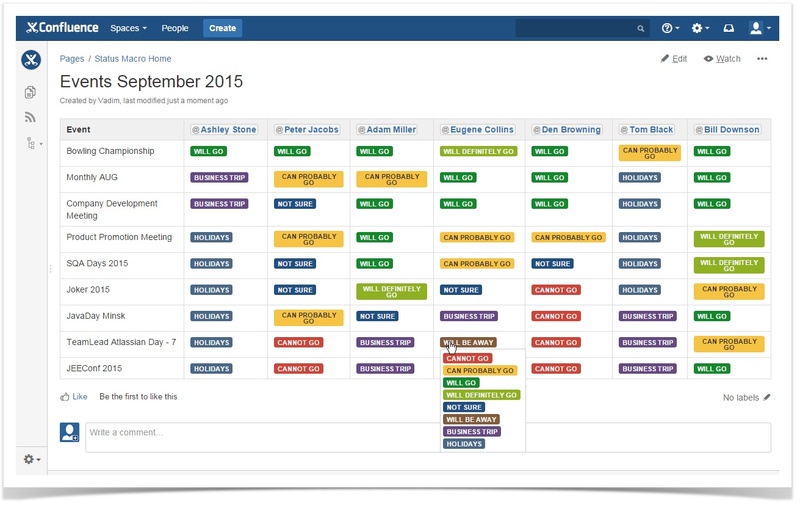 So now you can keep consistent task lists with statuses specific to your current needs. Let’s see in details all these features in real life. 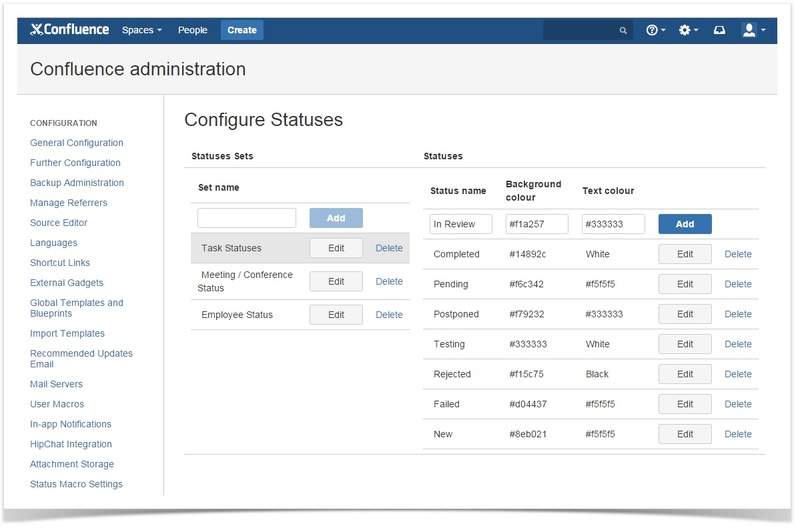 The add-on adds the administration section where Confluence administrator can manage status lists and manage the appropriate statuses for each list. While managing statuses you can set the background colors and text colors in HEX format or specify color names. 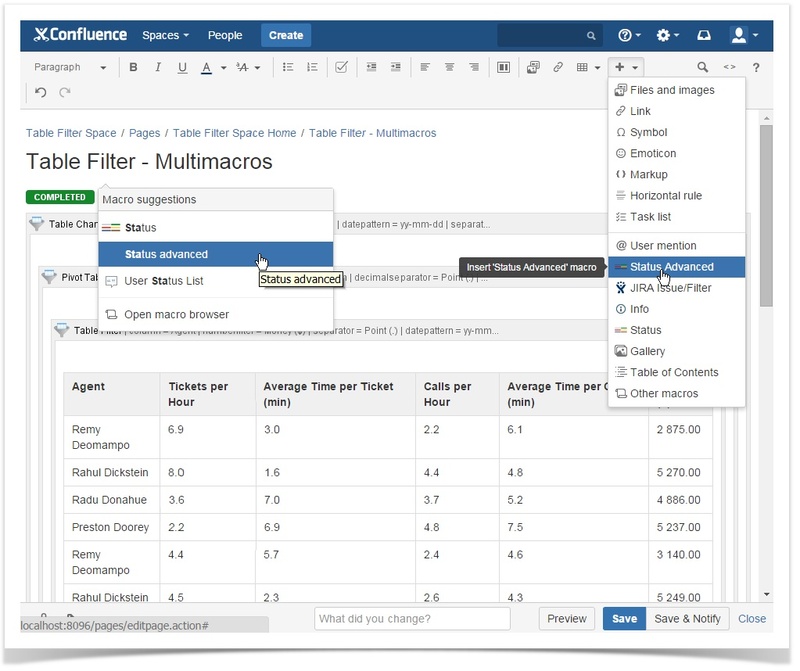 You can create individual sets of statuses for all your use cases and further use them on your Confluence pages. 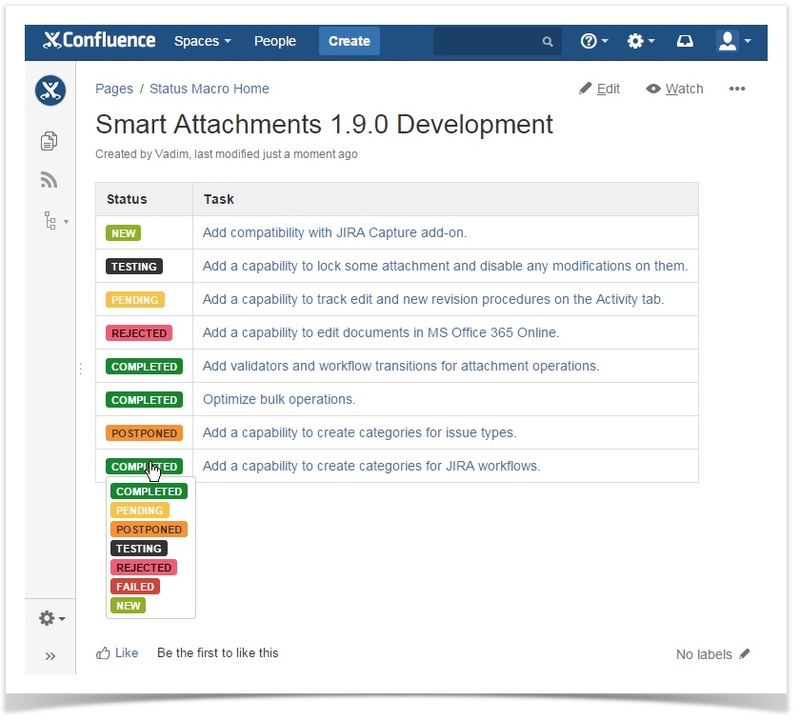 Interactive statuses are added to Confluence pages as native statuses. 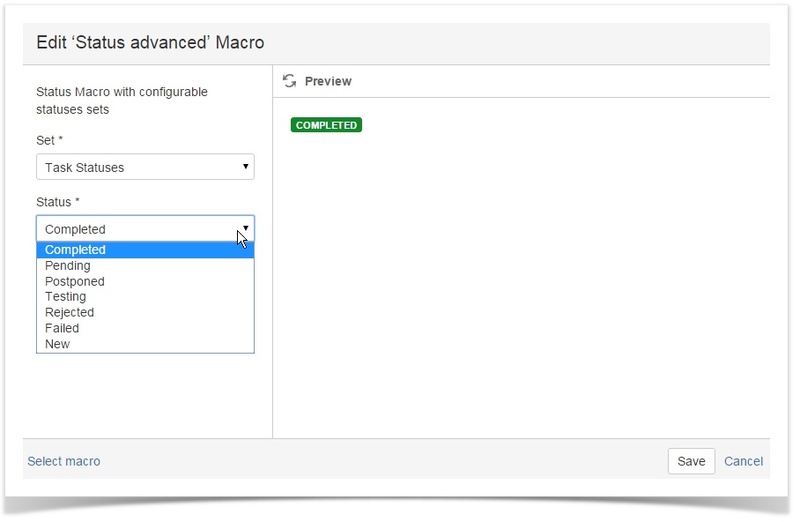 So you can either select from the Insert menu or enter the macro name on the page. While editing the macro you can select the appropriate set of macros and then insert the required status from the selected set. Optionally, you can apply the outline style the same as in the native Status macro. Usage of interactive statuses can be very efficient for management of issues lists. You can pre-define the list of issue statuses and the entire your development team can instantly indicate status on each issue in particular. This simplifies the overall collaboration and saves your time on constant switches to the edit mode. Another way you can apply interactive statuses in your Confluence is planing events within your company or within your teams. You can create a page blueprint with the list of team members and status macros. Then each team member can set his or her status for events and in such a way you can easily track the number of people going to the event. Setting status in the page view mode is quite easy and convenient, and your teammates will save a bit of time on doing this. Interactive statuses can be also used for page management when you can on the fly change the page status and indicate whether it is approved or not, or it requires review. 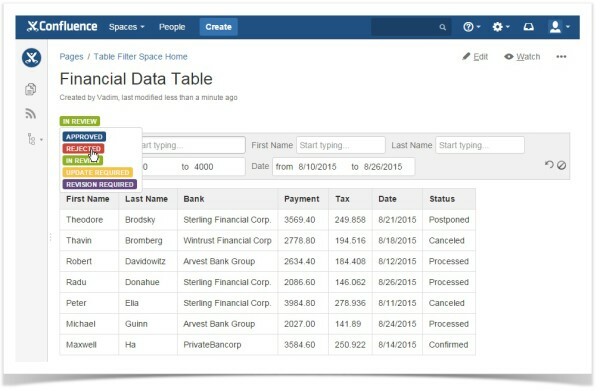 The add-on simplifies the user experience with status labels and provides a quick and easy way to update statuses. Handy Status macro (formerly known as Interactive Status macro) was released on March 29, 2016 as a part of Handy Macros for Confluence add-on and now is available in the Atlassian Marketplace.